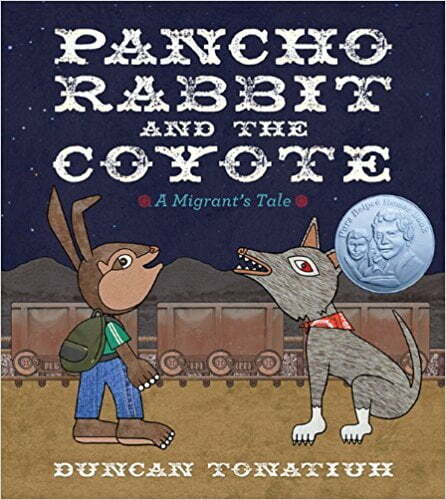 In this allegorical picture book, a young rabbit named Pancho eagerly awaits his papa’s return. Papa Rabbit traveled north two years ago to find work in the great carrot and lettuce fields to earn money for his family. When Papa does not return, Pancho sets out to find him. He packs Papa’s favorite meal—mole, rice and beans, a heap of warm tortillas, and a jug of aguamiel—and heads north. He meets a coyote, who offers to help Pancho in exchange for some of Papa’s food. They travel together until the food is gone and the coyote decides he is still hungry . . . for Pancho!